For HPE contact information, visit www.hpe.com/contact. To find a partner, visit findapartner.arubanetworks.com/aruba.html. The Aruba 310 Series access points provide the fastest gigabit data speeds and superb user experience for mobile devices, Internet of Things (IoT) devices, and applications in dense office environments. These Wave 2 access points deliver multi-user MIMO (MU-MIMO) aware ClientMatch to boost network efficiency and support the growing device density demands on your network. These APs have an integrated BLE Beacon to remotely manage battery-powered Aruba Beacons. With multi-user MIMO (MU-MIMO), you can transmit to multiple Wave 2 clients from an AP, at the same time. Aruba ClientMatch software groups Wave 2 clients together, enabling MU-MIMO. That means a faster, more efficient network. 310 series APs have an integrated BLE Beacon to simplify management of a large-scale network of battery-powered Aruba Beacons. See how Aruba MU-MIMO aware ClientMatch delivers the performance gains promised by Wave 2. Aruba Wave 2 APs can group MU-MIMO capable devices on the best APs, increasing network capacity. Even the slowest clients get a boost. Get the latest info about Wave 1 and the advances with Aruba 802.11ac Wave 2. Supports up to 1,733Mbps in the 5GHz band (with 4SS/VHT80 or 2SS/VHT160 clients) and up to 300Mbps in the 2.4 GHz band (with 2SS/HT40 clients). Enables location based services with BLE-enabled mobile devices receiving signals from multiple Aruba Beacons at the same time. Minimizes interference from 3G/4G cellular networks, distributed antenna systems and commercial small cell/femtocell equipment. Supports priority handling and policy enforcement for unified communication apps, including Microsoft Skype for Business with encrypted videoconferencing, voice, chat and desktop sharing. Adaptive Radio Management (ARM) technology automatically assigns channel and power settings, provides airtime fairness and ensures that APs stay clear of all sources of RF interference to deliver reliable, high-performance WLANs. 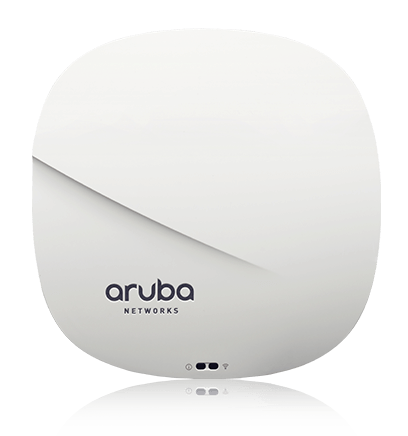 The Aruba 310 Series APs can be configured to provide part-time or dedicated air monitoring for spectrum analysis and wireless intrusion protection, VPN tunnels to extend remote locations to corporate resources, and wireless mesh connections where Ethernet drops are not available. Supports software upgrade to enable additional 5GHz spectrum when governments expand available frequencies. AppRF technology leverages deep packet inspection to classify and block, prioritize or limit bandwidth for over 1,500 enterprise apps or groups of apps. Integrated wireless intrusion protection offers threat protection and mitigation, and eliminates the need for separate RF sensors and security appliances. IP reputation and security services identify, classify, and block malicious files, URLs and IPs, providing comprehensive protection against advanced online threats. Integrated Trusted Platform Module (TPM) for secure storage of credentials and keys. For the 310 Series access points, the IPM power-save feature applies when the unit is powered by an 802.3af PoE source. By default, the USB interface will be the first feature to turn off if AP power consumption will exceed the available power budget. In rare cases, it may be necessary to take additional power saving measures, but in most cases, the 310 Series APs will operate in unrestricted mode. Aruba 310 Series APs offer a choice of operating modes to meet your unique management and deployment requirements. Controller-managed mode - When managed by Aruba Mobility Controllers, Aruba 310 Series APs offer centralized configuration, data encryption, policy enforcement and network services, as well as distributed and centralized traffic forwarding. Aruba Instant mode - In Aruba Instant mode, a single AP automatically distributes the network configuration to other Instant APs in the WLAN. Simply power-up one Instant AP, configure it over the air, and plug in the other APs - the entire process takes about five minutes. If WLAN requirements change, a built-in migration path allows 310 Series instant APs to become part of a WLAN that is managed by a Mobility Controller. For large installations across multiple sites, the Aruba Activate service significantly reduces deployment time by automating device provisioning, firmware upgrades, and inventory management. With Aruba Activate, Instant APs are factory-shipped to any site and configure themselves when powered up. AP-314/IAP-314: Four RP-SMA connectors for external dual band antennas. Worst-case internal loss between radio interface and external antenna connectors (due to diplexing circuitry): 0.6dB in 2.4GHz and 1.2dB in 5GHz. AP-315/IAP-315: Four integrated dual-band downtilt omni-directional antennas for 4x4 MIMO with maximum antenna gain of 3.6dBi in 2.4GHz and 6.0dBi in 5GHz. Built-in antennas are optimized for horizontal ceiling mounted orientation of the AP. The downtilt angle for maximum gain is roughly 30 degrees. The maximum gain of the combined (summed) antenna patterns for all elements operating in the same band is 3.1dBi in 2.4GHz and 3.8dBi in 5GHz. The AP ships with two (white) mounting clips to attach to a 9/16-inch or 15/16-inch flat T-bar drop-tile ceiling. For more country-specific regulatory information and approvals, please see your Aruba representative.